I was at church a few weeks ago, an hour before mass. The college-student musicians were rehearsing and as I spent a quiet hour in contemplation, the fits and starts of their rehearsal played out in my periphery. Soon my mind wandered to simply listening. Their music is just what I need each Sunday and one of the reasons I go to the ‘sinner’s mass,’ the last one offered. As I listened, I silently marveled at how such a beautiful performance in the next hour could come from a sub-par practice. I let my mind continue its wondering, thinking back to my own practices growing up. I played the saxophone and piano. The noise made by a substandard seventh grade sax player was a horrendous thing to listen to, I’m sure; my siblings made it clear they’d rather I not practice. The music group at church is substantially more talented but like many rehearsals, theirs was remarkably un-put-together. I find that life is much the same as these practices. It’s rough around the edges with fits and starts, jumping from a particular staccato section to the line down the page so as to get the timing down, and then sweeping in and out of the harmony, dropping each one part way through and picking up at another spot. There’s a randomness to it that is uncomfortable when our expectations are linear. 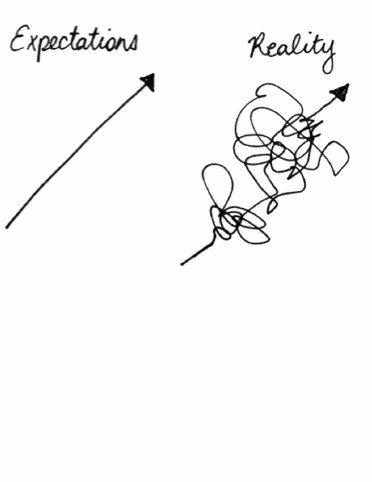 It reminds me of this diagram of expectations versus reality. Sometimes your goals feel far from where you’re at in the moment. Rather than feeling overwhelmed, think ‘What can I be faithful with today to get one step closer?’ and celebrate progress. What I’m trying to say through the disorder of these paragraphs, is that life is not meant to be clear. We don’t know what we’re in for when we start. The way through can be equally hazy. As Mary Oliver says, there are a thousand words or experiences or paths to be sorted, each one to be picked up and puzzled back together into some semblance of sense. Beauty can come out of the fragmented practices. The hard going and the demanding everyday workouts prepare and toughen us for the real tests, the big performances, the meeting of monumental goals, and dreams that once felt far out of reach. Sometimes we know what lies ahead; we are confident we can pull off the performance despite not having done it before. Other times we’re simply walking in faith, offering our best in each step and celebrating progress, even the barest glint of it, along the way. I spent half my childhood practically living at the home/nursery/farm of my two best friends down the road. Jari and Sheila, who I consider my second set of parents, gifted us the richest, grape-iest home-grown and pressed grape juice for Christmas. I’ve had gallons of it tucked away in the freezer for months, all the while trying to scheme up exactly the right way to make use of it. 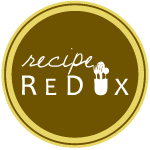 I boiled down a few cups into a thick, molasses-type concoction that is heavily infused with fresh ginger and rosemary. 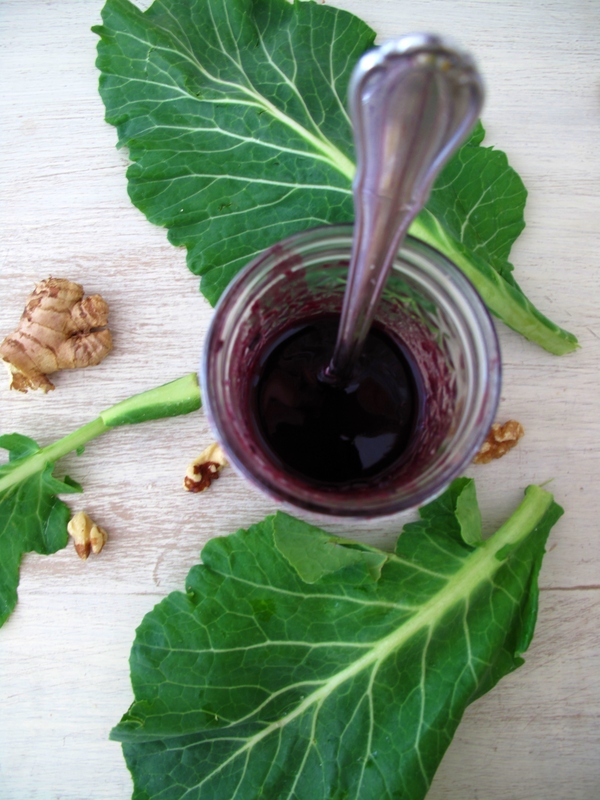 If you have an hour or so to mostly ignore a simmering pot, grab a bottle of grape juice and make syrup! 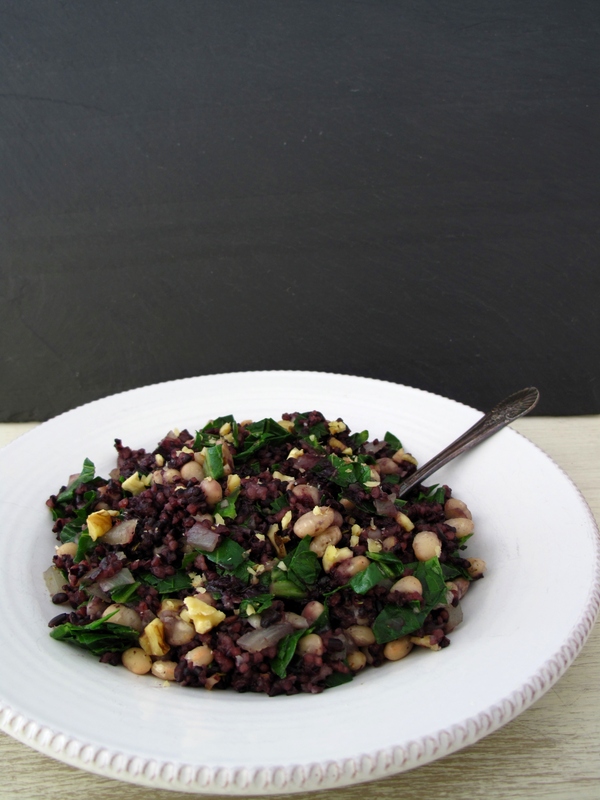 It is simply the best with earthy black rice, white beans, and whatever greens are on hand this spring. 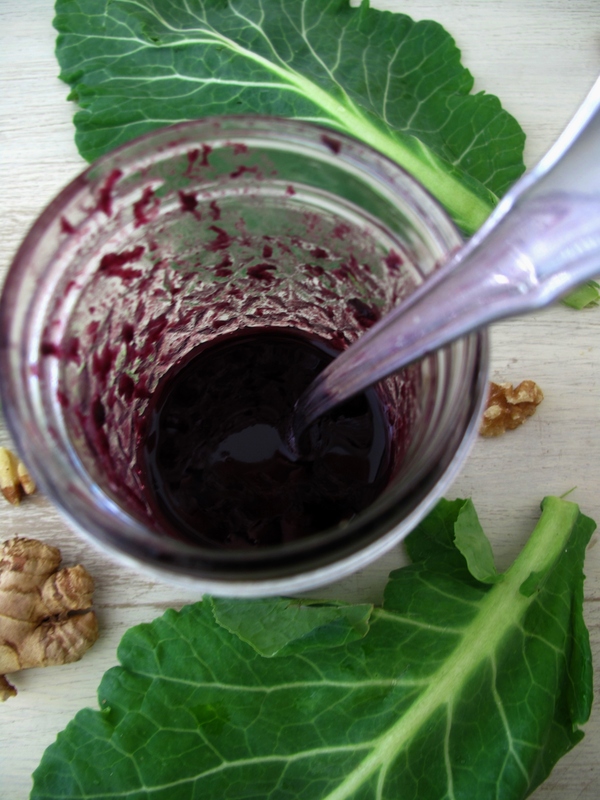 For the syrup: In a medium-sized saucepan, bring grape juice, ginger, rosemary and mustard to a boil. Turn down to a simmer and allow to cook until reduced to about 1 cup of syrup. 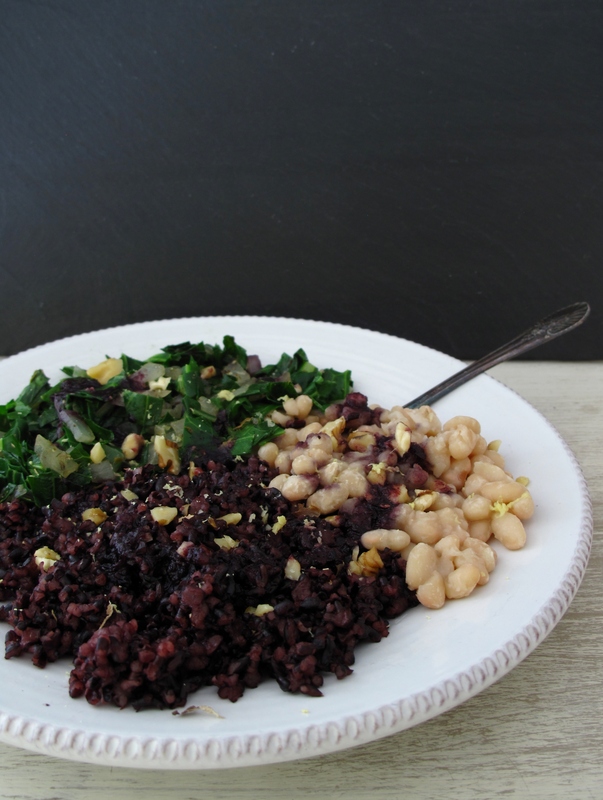 Meanwhile, prepare the rest of the ingredients by cooking the black rice, chopping the onion and greens, and toasting and chopping the walnuts. When the syrup is reduced, heat olive oil in a medium saute pan over medium-high heat. Stir in the chopped onion and cook until soft, about 10 minutes, adding a splash of water or more oil, as needed. 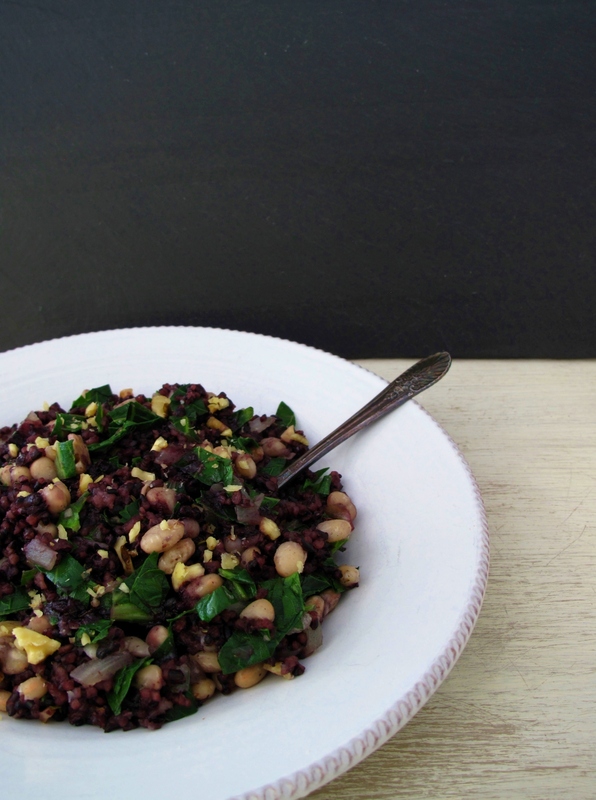 Then, stir in the salt, black pepper and greens. Cook just until the greens begin to wilt. 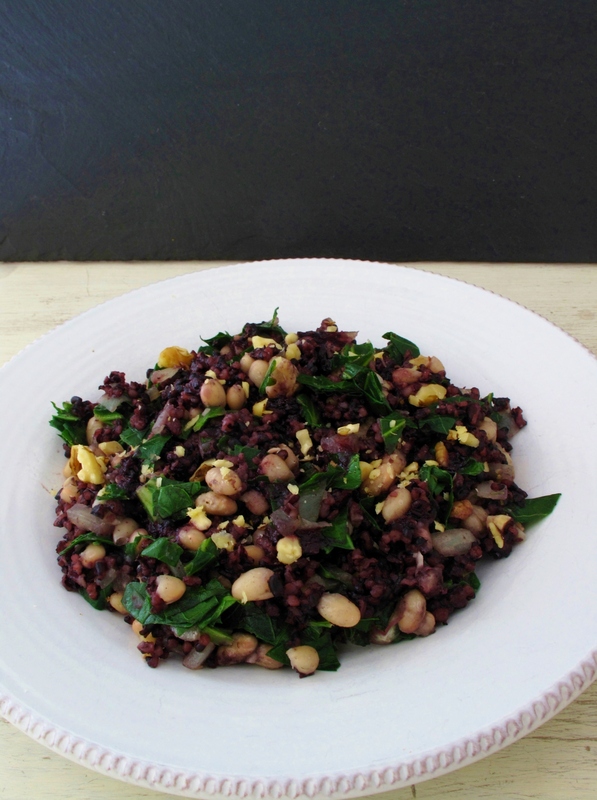 In a large bowl or on individual plates, stir together the rice, beans and greens. Top with walnuts and drizzle the syrup over the top, stirring through before serving. Fresh grape juice! I’m jealous! This is fantastic! 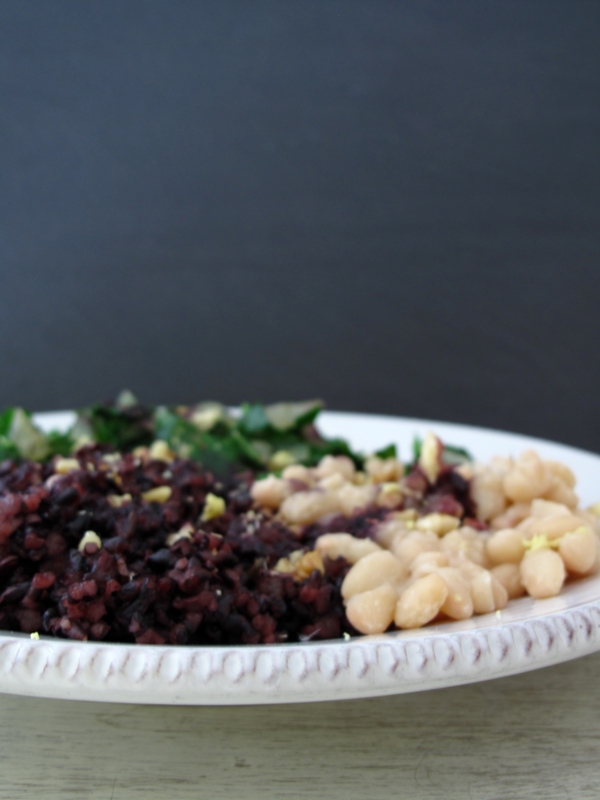 Love the colours you’ve achieve here – what a gorgeous dish.